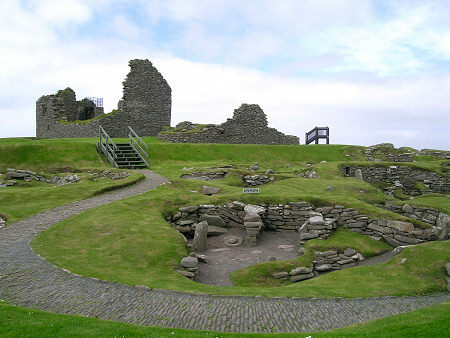 Jarlshof is one of the most inspirational archaeological sites in Scotland. That may seem an extravagant description in a country that has Maeshowe, the Ness of Brodgar and, Skara Brae. 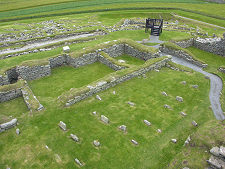 But while Skara Brae brings to life a moment in our remote past, Jarlshof shows you each of the steps that link an almost as remote moment in our past to an era whose buildings still stand around us. It is almost as if, some 4,500 years ago, someone set aside a piece of land and declared that its purpose was to provide future generations with examples of every important form of habitation used by the people of the day. The result is, on one site, overlapping examples of housing from the Stone Age, Bronze Age, Iron Age, Pictish, Norse and Medieval eras, right the way through to the 1600s. 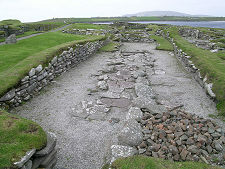 This bring to light another important difference between Skara Brae and Jarlshof. 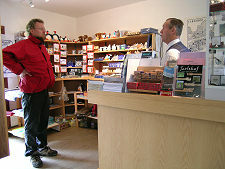 You can enjoy Skara Brae without really thinking about it very much. What it represents is the experience of something our long distant ancestors experienced: the chance to gain a real insight into the day to day lives of the real people we normally think of only as artists' impressions dressed in animal skins. 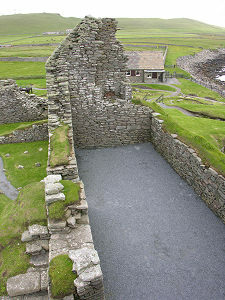 To really appreciate Jarlshof and get full benefit from it, you need to understand the various elements of it. Even those of us blessed with the attention span of a two year old, who habitually skip the audio visual intro at many modern museums, need to curb our enthusiasm to be "out there", and pay attention to the short intro given by the custodian. It really does help understand the site. Because what was unearthed at Jarlshof, and what is on show today, is incredibly complex. Approach it at a touchie-feelie level without thinking about it, and all you'll see are various differently shaped piles of stones. And the real magic of Jarlshof will have passed you by. 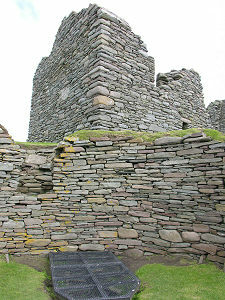 In one sense the story of Jarlshof is very similar to that of Skara Brae. In the late 1800s a storm washed away part of the low cliff here, and revealed evidence of ancient structures underneath. Serious archaeological excavation started in 1925. 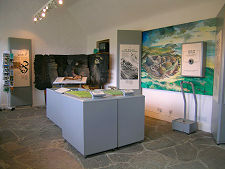 The Jarlshof you find today is presented as a walk through history. You start near the earliest signs of settlement on the site, hearths and badly damaged walls set within layers of midden and dating back to before 2500BC. Other layers in the same area account for the following 1,000 years or more. The first thing you can really visibly identify as a settlement is close by, and comprises several structures dating back to 800BC, or the Bronze Age. Partly overlying the Bronze Age settlement is an Iron Age settlement, including the house nearest the visitor centre, whose internal floor plan can be clearly seen. 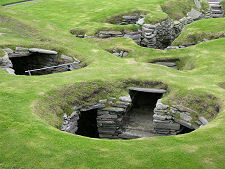 Two of the Iron Age houses had souterraines, underground storage chambers, that can still be viewed today. 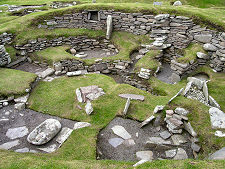 The next stage in the story is a broch. 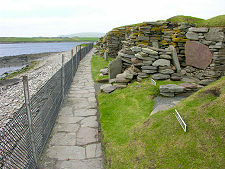 This is visible in section, having been effectively cut in half by the action of the sea before defences were erected. What you find are the lowest few feet of the broch, with its massive main wall almost directly overbuilt by the 1604 Old House of Sumburgh. It's tempting to wonder what the builders of the Old House thought they had found when they dug into the massive stonework of the broch: or, indeed, whether they thought anything of it at all. 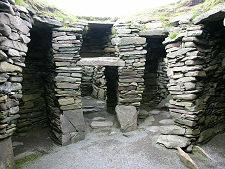 This is the most obvious example of a recurring theme at Jarlshof: what must each successive generation, each successive age, have made of the remains of earlier generations around and beneath them? They must have been as naturally curious as we are. Move on again, and you come to the four wheelhouses of the Pictish age. These represent the most complete - and therefore perhaps the most interesting - of the structures on the site. Here you can begin to fit real people into the mental picture in a way that is much more difficult with the earlier, more fragmentary, structures. 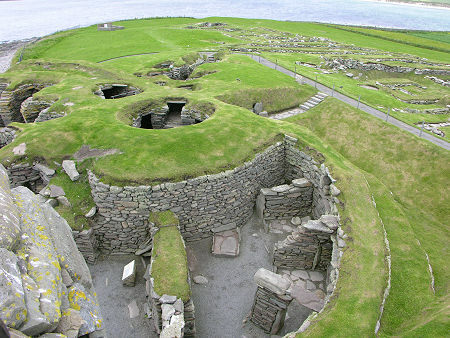 Just inland of the structures you have already looked at are the remains of a Norse village. This steadily developed over the years between 850 and around 1300, when it was abandoned in favour of the Medieval farmhouse whose remains lie to the south of it. And in time, that, too was abandoned. 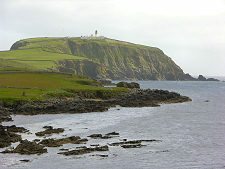 In 1472 Shetland formally became part of Scotland under James III. In the mid 1500s Earl Robert Stewart, an illegitimate son of James V, became Lord of Shetland. 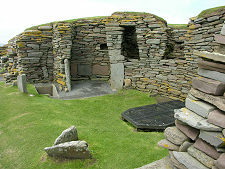 He constructed as his main base on Shetland the building now known as New Hall. 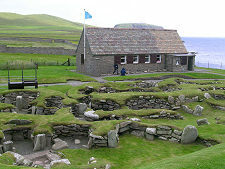 In 1604 his son Earl Patrick Stewart family built what later became known as The Old House of Sumburgh. This had in turn been abandoned by the end of the 1600s and, for the first time in over 4,000 years, no one lived on the site. Oh, and why is it called Jarlshof? Well this was an invention of Sir Walter Scott in his novel "The Pirate", following a visit to Shetland. But it's as good a name as any.